Incorporating the previously outlined considerations my plan was to take a tour with a group and then be dropped off on an island to begin my kayaking expedition. I heard so many good things about Planet Blue Kayaks (aka Paddling Palau) and wanted to go with them. I had hoped to arrange everything by email. I sent several emails but only received general information that is available on their Web site. Impac wrote back several times and were willing to drop me and the kayak off on an island after their tour and pick me up again. I was concerned about what kind of kayaks they carried. I suspected that Planet Blue was the only operator that had expedition ones (with storage compartments). They said that their usual lunch stop was Margie's Beach but the rainwater tank there (which I didn't even notice) was not maintained and should not be used for drinking or cooking. Fish n' Fins gave their kayak rates (the least expensive of all) but did not answer my question about being dropped off. When I got to Palau I went to Sam's Tours (Planet Blue Kayaks) and arranged to meet with Ron Leidich's wife (he was out of the country at the time) and their kayaking guide. What I learned at Planet Blue was they don't take kayaks out on diving boats so you can't be dropped off that way, their kayaking trips only happen if enough people sign up for them and that can't be foretold in advance. 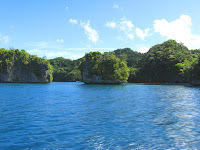 Most of their kayaking trips are close to Koror and thus no shuttle across the dangerous surf area. So, to get to the outer rock islands I would have to be specially transferred. The cost was $150 from their base in Malakal to Ulong Island (a distance away) and also $150 from nearby Margie's Beach to Lee Marvin Beach. $300 for transfers. I think the price was excessive. I was given the excuse of the high price of gas. 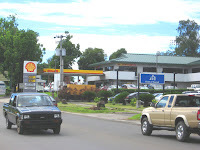 It was $4.78 for regular in Koror as shown in the photo taken at the time of my trip. It should be substantially lower now. Because of the length of my trip, originally planned for 8 nights/9 days, my camping gear rental cost was $20 per day and the kayak was $30 per day. There were no additional costs. Looking at the current rates it appears that now a slightly larger discount is available for longer rentals.